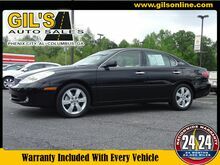 This 2005 Lexus ES 330 Base is a great option for folks looking for top features like a dual climate control, anti-lock brakes, and side air bag system. It comes with a 6 Cylinder engine. We've got it for $14,995. With an unbeatable 4-star crash test rating, this 4 dr sedan puts safety first. Rocking a dazzling black exterior and a gray interior, this car is a great pick. This is the vehicle you have been waiting for! Call now to schedule a test drive!